“I Heard That”: Saxophonist John Handy Receives SFJazz Beacon Award! Saxophonist JOHN HANDY has played many styles of music during his long prolific career. During its 27th Annual San Francisco Jazz Festival (SFJAZZ) Fall season, the genius altoist/composer lifetime achievements recognized Sunday evening, November 1, at Herbst Theater, presented with the prestigious SFJAZZ BEACON AWARD! Handy has blazed a brilliant trail as an innovator, improviser, composer, band leader and educator! 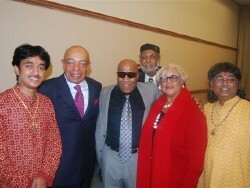 The Award acknowledged his vital role in preserving JAZZ traditions and fostering the growth of jazz in the Bay Area. The visionary saxophonist has been a part of the fabric of San Francisco’s JAZZ scene starting in the early years of his music journey; lived in the Western Addition section of the City (Baker Street near McAllister) during those lively nightclub actions where he performed on Divisadero, The Fillmore (BOP CITY). Several years ago, moved to Oakland. Those of us who have followed the world traveled hard working artist through the years, there Sunday evening to rejoice with him, and enjoy the music – A NEW PIECE OF WORK! What an AWESOME evening! RANDALL KLINE, SFJAZZ Founder/Executive Artistic Director shared words of greetings, introduced KCSM Jazz station’s GURU – SONNY BUXTON, Host emcee, enthusiastically expressed he has followed Handy’s musical journey since the days of the 60s when Handy led the house band at BOTH/AN on Divisadero St., at the time one of THE Jazz Clubs in the City! The evening embraced the “FOUR FACES OF JOHN HANDY” which musically navigated through the transitional periods of his life. Born in Dallas, TX February 3, 1933, started playing in 1949, family moved to Oakland where he graduated from McClymonds High School. The 1950s and 60s the GOLDEN AGE OF BOP, Handy was in the midst of the movement! Recognized as one of the most creative young saxophonists on the scene, hard BOPPIN’ CHARLES MINGUS hired him to join his band in 1959; thus thrust Handy into the New York City spotlight and rave reviews! After a rewarding experience under Mingus, Handy formed his band and a star in his own right with an UNFORGETTABLE TRIUMPH performance at the 1965 MONTEREY JAZZ Festival – BLEW EM’ AWAY! Accompanied with high energy unit, etched forever on the CD, “Live at Monterey,” that included musicians: violinist MICHAEL WHITE, guitarist JERRY HAHN, bassist Don Thompson and drummer Terry Clarke. Handy signed to Columbia Records – recorded three albums 1966-68; 1976 commercial box office hit “HARD WORK,” a funky R&B upbeat dance rhythm, exposed the name JOHN HANDY to non-Jazz followers, and raised eyebrows of pure jazzists! Handy is BEST known for Hard Work!!! Always evolving, Handy forged new ground when he embraced folk jazz fusion, through his pioneering WORLD music collaborations with Indian sarod master ALI AKBAR KHAN; – Handy’s interest in Middle Eastern music spiritually consumed; embraced the culture in dress; for years he wore long garments, headgear and dashikis. Fascinated with the violin sound since working with Michael White, he formed “John Handy with CLASS” – three lovely classically trained violinist (Tarika Lewis, Sandi Poindexter, Julie Carter), taught them what improvisation Jazz was all about! The violin is traditionally associated with classical, symphonic music, and European instruments. Class intertwined with creative Handy charts. Handy polished in style, wore Black Tux and TOP HAT! They were the TALK OF THE TOWN! Recorded several albums, one “Centerpiece.” Handy involved the late vocalist BUDDY CONYERS’ unfiltered jazz and blues stylings! Eventually back to wearing suits, the masterful musician returned to his roots of jazz, improvising with various collaborators – HANGING OUT! Just this year the prestigious MOSAIC label released a box set of the altoist’s classic quintet recordings of the mid-1960s that included an unreleased recording material from a 1967 concert. SUNDAY night the four faces of Handy and his past collaborators joined him on stage to celebrate the marvelous evening! Flying in from India – VIKASH MAHARAJ (sarod), PRABHASH MAHARAJ (tabla), MICHELLE “Sita” COLUCCI (Tanpura); Violinist TARIKA LEWIS (Class) ; AWESOME CARLOS REYES (violin and harp); DAVE MATTHEWS on piano … JEFF CHAMBERS, bass; soulful/hip jazz singer KENNY WASHINGTON. The evening embraced Handy’s four spanning career phases. AFTER intermission the entourage of musicians gathered with Handy in what was a BEAUTIFUL PIECE OF WORK! Stellar Jazz vocalist Kenny Washington’s tender singing of “Sometimes I Feel Like a MOTHERLESS CHILD” SUITE – mesmerized by his softness, pin dropping silence, jolted by the abrupt explosive VAMP solos under Handy’s symphonic directions which seemed to last 5-minutes, then Handy’s high tones on sax, like a fleeting bird soaring higher, walking among the musicians – BRILLIANT! Ending as it had begun, Washington singing the closing lyrics, immediate standing applause from the audience! The evening concluded with Handy’s amazing foray into the 1965 hit “Spanish Lady,” improvisation, new leanings, exciting! JOHN HANDY is a SURVIVOR, always evolving musically, a pioneer THAT has always been ahead of his time! WHAT’S NEXT??? TODAY IS VETERAN’S DAY! A time to pause to honor those men and women who bravely serve their country in Harms Way. The FT. HOOD MASSACRE was sad, shocking to be killed on what is supposed to be FRIENDLY grounds – murdered on U.S. SOIL! A key Base where military personnel will be deployed to Afghanistan, and an uncertain future; some will not return. My heartfelt sympathy reach out to those loved ones and friends in their tragic loss! May God give them strenght and understanding during these trying days.